The richest man or woman in town is a very happy human being. In my book, I closely correlated self-made success and its resultant wealth with happiness. I said this book proves that money does indeed, buy happiness. Along my journey of writing the book and interviewing these great American success stories though, I often thought that I would one day find a miserable richest person in town. That day never came. RMITs and RWITs alike kept convincing me that they were truly happy, almost blissfully satisfied with their lives. I determined that the peace and pleasure that comes from the feeling of having made it yourself was the most supreme key to happiness. A new study recently came out and it confirms my findings. Researchers and psychologists, Chris Byoce from the University of Warwick and and Simon Moore from Cardiff University, looked at how individual people evaluate their income and personal wealth. 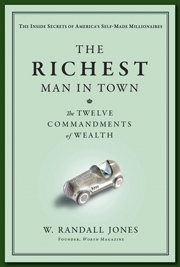 Every major study that I reviewed while writing The Richest Man in Town suggested that people do tend to compare their success and attendant wealth in relation to their peers. In other words, the more money one has relative to one’s community seemed to have a significant effect on a person’s general happiness. Boyce and More reveal that it is status after all that matters most. It is no wonder then that the richest man or woman in town is so content. They have won the game and consequently they receive all sorts of benefits from ascending to this titular plane. Not the least of which being their own private plane. It’s something that the rest of their local peers don’t have. Admiration though is surely at the top of the list. Being admired does wonders for one’s self-esteem. Where we rank in society then really does matter, and this latest study from the University of Warwick and Cardiff University proves it once again. Money may not technically buy happiness, but it will buy you status and that seems to go along way toward feeling good about yourself. Here’s to joining that rank! And the 12 tenets in my book are a good place to start if you aren’t there yet. Enjoy the voyage.